Heated honey causes ill health: A mistake most people do with raw honey. If you are seeking to improve your diet and overall health by eating healthy, chances are that you are using raw honey as an alternative to refined sugar. And that’s great! But, like many people, you could also be using raw honey in your healthy cooking and baking as the “healthier alternative”. But, think of it this way … we are taught never to use pasteurized honey, as heat kills all the good enzymes and nutrients. What this does is reducing the honey to a concentrated form that is only sugar, increasing the glycemic index. By the way, science lab studies have observed that raw organic honey contains these precious components: vitamins, minerals, enzymes, antioxidants, flavonoids, amino acids and probiotics (Lactobacillus Kunkeei). Pasteurization is introduced to honey for a different reason from pasteurized milk. Raw honey in its natural state has no harmful bacteria because it is not conducive for the bacteria! One of the few things that can live in honey though, is a kind of yeast called osmophilic yeasts in honey, that can reproduce in honey that may have a higher moisture content. This can cause fermentation. Although fermented honey does not necessarily pose any health risk, some honey sellers decide to pasteurize the honey (to less than 18% moisture) so that the honey will have a longer shelf life without fermenting. Most companies use the “flash heating” method by heating the honey very quickly to about 160oF/71oC and then rapidly cooled. This pasteurization will kill any latent yeast cells that might be present to remove any chance of fermentation that will reduce their sale of honey, thus their profit margin. Pasteurized honey will also last longer in its liquid state than unpasteurized honey, which makes for a more appealing-looking product for both retailers and consumers. If you see crystalization in your bottle of honey, you know that your honey has not been pasteurized! Read: How to tell if your honey is real or fake. So, if we want to avoid pasteurized honey, why do we buy expensive raw honey only to take it home and cook or bake it? That makes your honey quality to become as “pasteurized”. Not only does the home cooking destroy the enzymes and nutrients, they actually do more damage than just sugar! Honey is regarded as essential medicine and food in Ayurveda, a 5000-year old system of traditional diet and holistic healing that has its origins in the Vedic culture of India. In Ayurveda, honey is an important food used for strengthening the health of the heart and the eyes. It warms the body by stimulating metabolism, unlike other natural sweeteners. Ayurvedic recommends adding a small amount of raw honey in a cup of warm (not hot) water first thing in the morning to stimulate a healthy metabolism that last the day long. This supposedly helps increase your weight-loss efforts. While Ayurveda recognizes the many health benefits of honey, it strongly advise against heating it for any reason. It claims that heating honey to 104oF/40oC or above can cause a negative chemical change that causes the honey to taste bitter. This defeats the purpose when what you want to achieve is a little “healthy” sweetness. Consuming heated honey over time can contribute to ill health. Ayurvedic reasoning is that heated honey becomes like “glue”. This ancient health system understands that cooked honey turns the molecules to be “gluey” and adhere to mucus membranes in the digestive tract, producing toxins called “ama“. Literally, ama means undigested food or toxins that stay in the digestive tract. We now know that these undigested matters stay in the digestive tract walls, forming encrustrations that rot and cause health issues. It is said that heated honey is one of the most difficult forms of encrustration to cleanse. This is why a proper gastrointestinal cleanse is necessary, and one of the very few ways to detoxify to be rid of this toxin. Honey that is cooked becomes one-dimensional. It loses the nuances of flavor that raw honey contains and becomes just concentrated sugar. The longer it is cooked the more concentrated it becomes. Consuming heated honey will increase sugar spikes as your body cells are no longer able to assimilate the distorted molecules, thus increasing the glycemic index. At this refined state, the pH level is also altered and probiotics are destroyed, rendering its anti-microbial properties useless. 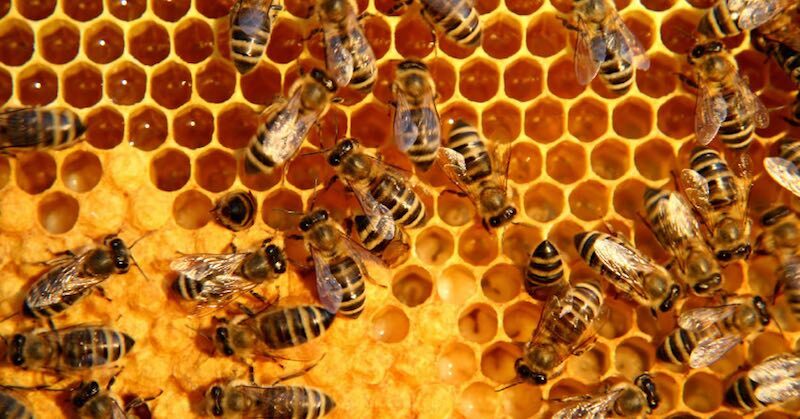 The very health reasons why we eat honey. Whether you believe in ancient traditional health system or not, here’s what modern science says about heated honey. Basically, the finding is that: raw (uncooked) honey is nectar, whereas cooked honey is poison, in fact may be carcinogenic (cancer-causing). One scientific paper looked at both heating honey and mixing honey with ghee in equal proportions, both deemed toxic in heated form, by the ancient health system. This study showed that when honey is heated, it produces a chemical called hydroxymethyl furfuraldehyde (HMF) as well as altering the chemical content in other ways. While the study was performed on rats, it concluded that HMF “may produce deleterious effects and act as a poison in due course“, especially when these two components are mixed. It is not rocket science to understand that cooking will alter the beneficial properties of most raw foods. Enzymes, vitamins and probiotics are destroyed when heated. Scientific research puts this heating point a little higher than Ayurvedic, at above 118oF/48oC. Foods heated above this critical temperature, even if only for a very brief moment, are said to be cooked, or simply put—dead. P.J. Chandler—author of the Barefoot Beekeper—a pioneer of natural and sustainable beekeeping wrote that bees fed with heated honey perished. This is likely due to the increase in HMF that occurs when honey is heated, and is chemically toxic to bees. Whether HMF is harmful for human or not, the fact that it kills bees is enough for me to heed the Ayurvedic warnings. Proportionally, we are way larger than a bee. If heated honey killed bees, then it may do some harm to a human body, it just takes more in terms of volume and time. The principle of not heating honey applies to manuka honey as well. Why pay high prices for good honey that has been preserved in its natural, raw state only to take it home and kill it yourself? Rather, we should be using honey as a healing food in a respectful way that preserves all its benefits. How Can You Safely Use Honey Without Destroying Its Goodness? The boiling point of water in a kettle is at about 212oF/100oC. This temperature may vary depending on where you are (altitude affects the boiling point temperature). This temperature is way too high over the recommended temperature to preserve the beneficial properties of honey. Boiling, cooking and baking will all exceed this recommended temperature. And the more they are left in the heat, the more harmful it becomes to your cells. We are clear now that heated honey is not health-giving food but we rarely do eat honey in big amount. So I would say that eating heated honey every now and then, in moderation, may not pose too big of a problem. However, if you do add raw honey into your hot drink daily, it is best to let your hot beverage cool down considerably to warm, before adding your honey. Besides, at about 104oF/40oC is when your beverage is comfortably warm to the lips for a delicious drink, while preserving the precious medicinal values of your expensive honey. What Are The Healthier Alternative Sweeteners For Cooking? As mentioned, if you are using honey for cooking very rarely, it is probably fine. But, if you use it frequently, then consider using pure real maple syrup that can withstand high heat without changing its make-up. Please refer to this list for other safer alternatives you can use, and use them in moderation.